This blog was written by Pauline Rose, professor of international education at the Faculty of Education at the University of Cambridge, and director of the Research for Equitable Access and Learning (REAL) Centre, and Justin w. van Fleet, president at Theirworld and executive director at the Global Business Coalition for Education. It was originally published on the Devex website on 4th April 2019. Evidence, investment, and impact are a winning combination — but when ignored, the consequences can be extreme. A new study by Theirworld and the REAL Centre at the University of Cambridge highlights that just a few years into the Sustainable Development Goals (SDGs), the international community is teetering on the brink of a dangerous downward trajectory in its failure to invest in early childhood education. The small change all global donors collectively invest in for the education of the world’s youngest and most vulnerable citizens — just $0.26 per child per year — will never allow countries to unleash the potential and ambitions of the SDGs by 2030. In the years just prior to 2015, advocates and academics came together to promote early childhood education’s inclusion in the SDGs. And they were successful: the global community agreed that all girls and boys should have access to quality pre-primary education by 2030. They would not have imagined the SDG victory would instead lead to declining investment in young children’s education. We’ve found that between 2015-2017, aid spent on pre-primary education fell by 27 percent, from $94.8 million to $68.8 million. This is against a more positive backdrop of an increase in overall aid to education. For children in conflict areas, who are amongst the most marginalised globally, the results are even more chilling: just $0.17 was invested in their early education per year. The decrease in aid to early childhood education is all the more surprising given the lip service from world leaders about its importance. From speeches in Incheon and New York to Dakar and Istanbul, donor countries and international institutions committed to investing in early childhood education. After all, who could deny such an investment case? Before the age of 5, over 90 percent of a child’s brain development takes place. It has been estimated that investing just $1 in early childhood care and education can show returns as high as $17 for the most disadvantaged children. The International Commission on Financing Global Education Opportunity highlighted the need for progressive universalism: investing early and in the most marginalised children is the first step in achieving the “Learning Generation” trajectories. Yet donor actions have fallen far short of their words. Of the 25 top donors to education, only 17 reported any financing commitments at all to pre-primary education in both 2015-2017, according to our findings. Of these, nine donors have decreased their commitment, signifying a worrying trend at odds with their own policy statements. 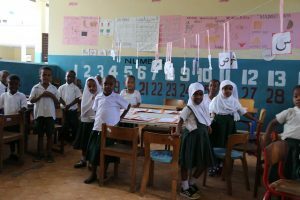 While international aid may not be the full solution to early childhood education, it sends a strong signal to countries around the globe about international priorities. According to the Education Commission, the total amount required to achieve two years of free, quality pre-primary education in all low- and-middle income countries will reach $144 billion annually to the sector by 2030. The international community would need to significantly increase its overall volume and share to help countries bridge the financing gap. While the World Bank remained the largest donor in volume, it only reported spending around $15.7 million on pre-primary education in 2017 to the Organisation for Economic Co-operation and Development’s Development Assistance Committee, down significantly from 2015. As a result, it has fallen two places in our ranking. The World Bank’s internal calculations are more optimistic, suggesting programme approvals of nearly $140 million that year. We look forward to these approvals translating into actual spending in the coming years. UNICEF has increased its percentage to early childhood education between 2015-2017, although this is in a context of overall decreased education spending by the organisation. While not the largest donor in volume terms, it is now No. 1 in the ranks. 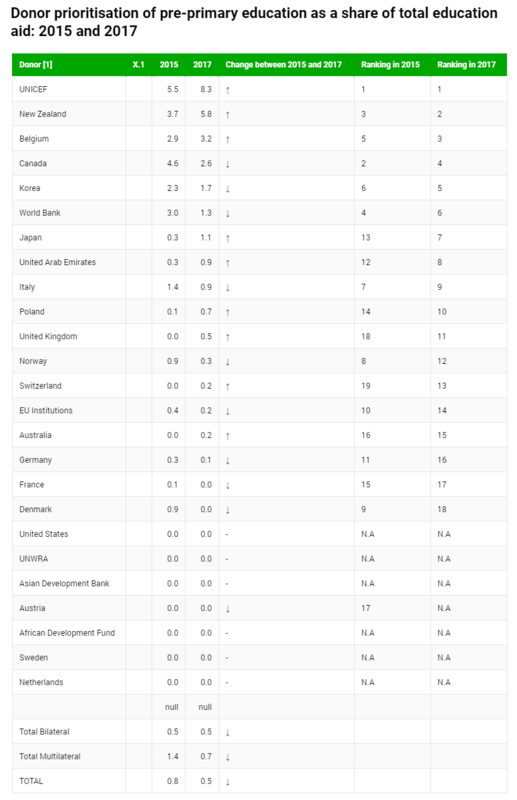 Meanwhile, countries such as Denmark, Norway, Canada, Italy, Germany, and France all dropped in their rankings, while the United Arab Emirates, United Kingdom, and Belgium climbed the charts. Adding to the shocking lack of financial support for pre-primary education is the fact that donor spending is potentially reinforcing inequity. In the same period that donor spending declined overall for pre-primary education, aid funding scholarships for higher education among young people who have completed secondary school increased. Donor spending on scholarships is now 42 times higher than donor spending on pre-primary education. For the 150 million young children around the world who are not currently able to access early childhood education, the most disappointing result of our study is that the overall size of the financial pie has decreased considerably over two years. These young children will only learn how the international community let them down when it is too late. Now is the time to turn rhetoric into action. Donor agencies must rise to meet the goals countries set to achieve pre-primary education. Starting with the major multilateral organisations — the World Bank and regional development banks, Global Partnership for Education, UNICEF, Education Cannot Wait, and the International Finance Facility for Education — steady progress to the 10 percent target must be achieved. Otherwise, the “small change” invested in early childhood education will continue to yield small change for the world’s most vulnerable children.